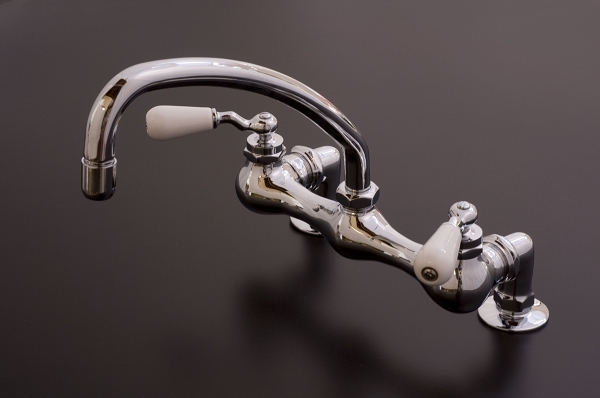 Madeira Deck Mount Kitchen Faucet w/ Curved Spout and Porcelain Lever Handles. Solid brass construction in choice of finish. Our Mac Select faucets are constructed with high quality, low lead brass and meet all current regulations with regard to lead composition. Features 1/4 turn ceramic valves, which consist of 2 ceramic disks that rotate to open and close the valve, minimizing mechanical wear. Measurements: 12 1/2-inch spout extension, 9 1/2-inch height, and 2 1/4-inch base diameter.